Yeah, I know, I haven't posted for a while. I fell out of the habit, I guess. I've been playing Legion a fair bit though. I'm a bit behind the curve, only ilvl 825 or so. 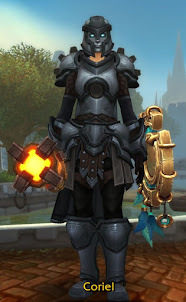 I haven't stepped into Mythics or raids yet, though I've been looking for a guild on Lightbringer. So far everyone seems full up on Holy paladins, sadly. In any case, I'm using a new addon, World Quest Group Finder, that's really nice. It allows you to automatically make or join groups that are doing the same World Quest as you are. It's pretty nice, making grouping for world quests a lot easier. Now, you can do all the world quests solo, and kill credit is usually shared, but having an actual group is pleasant, and useful for sharing credit for other objectives. Especially as I am often questing as Holy, so I get to feel more useful with heals. It's pretty smooth and pretty automatic. When you enter a World Quest area, the addon will automatically ask if you want to join a group. If you do, it's pretty much automatic from that point, searching the group finder or adding you to it. In fact, if you look at quest group finder right now, you'll probably see a few groups created by WQGF users. It's a really nice tool for making questing a bit faster and a bit less lonely than pure soloing. Eve Online announced a F2P or unlimited trial variant. Basically, you can make a character with a restricted number of skillpoints and skills and play for free. To get a full character, you have to be a subscriber. It's an interesting choice for Eve. The biggest advantage is that it gives the new player a long time to truly come to grips with the game. Eve is infamous for its learning curve, and now there's no time pressure on learning how to play. The interesting side will be seeing how the current Eve players abuse this mechanic. At certain levels, Eve is often a numbers game, and now each side can field arbitrarily large numbers. For example, instead of scouting multiple systems in a patrol with a single ship, you could instead station one character per system, and log onto each character in turn. If I remember correctly, Eve did crack down on multi-boxing, so maybe that will mitigate the effect. Another concern is that Eve often boasts that a new player can become "useful", even to the major powers, within a few days. But if that new player is useful, surely a couple hundred alpha accounts is even more useful. But if you nerf the usefulness of the alpha accounts, are you not also nerfing the usefulness of the new player? WoW has an unlimited trial, where you're limited to level 20. But no one cares about level 20s. They're pretty much useless in the greater scheme of things. So there's no need to worry about players (other than gold-sellers) making tons of level 20s. Will low level characters in Eve become more useless, thus diminishing that selling point? 2. Useful low level characters. I think that these need to be mutually exclusive to be balanced. If you have infinite amounts of useful low level characters, the game is going to break. That means I expect Eve Online to eventually choose Option #1 over Option #2.